My two favorite food-related shows - behind the modern day classic Guy's Grocery Games - are Netflix's Chef's Table and PBS' The Mind of a Chef. The Mind of a Chef follows one or two chefs per season as they explore the things that interest them in the food world. David Chang, chef of Momofuku in NYC and one of the men behind Lucky Peach magazine, was the first season's star. He explored NYC and Japan, cooking with rotten bananas, and getting shitfaced at the Buffalo Trace distillery with season two's star, Sean Brock. Brock's season had a heavy focus on the South and cooking with local ingredients. I don't think he was as captivating as Chang (who is like a less wordly, more brash Anthony Bourdain), but I have longed to eat at both of their restaurants ever since. I was in Nashville for a wedding a couple weeks back, so I finally got my chance: time to eat at Husk - Nashville. The restaurant's located a short walk from the main downtown area in a renovated old house. The lighting was romantic (dark), which made photo taking a little difficult, but I still think you'll be able to gauge the deliciousness levels. Things kicked off with the Cheerwine Glazed Belly Ham Soft Rolls, which were astoundingly good. Like one of the best things I can ever remember eating good. I've only been fortunate enough to eat day-after-Christmas ham leftovers a few times, but take the deliciousness level of those leftover ham sammies and imagine replacing your Honeybaked Ham with the most delicious ham ever created, a freshly baked soft roll, pickled onions and cucumber, then a little smoked Duke's mayo. They're that good. I want to go back to Nashville and eat these again, then find whoever produced the ham, marry his daughter, and become the heir to their porky throne. Next were the best Fried Chicken Skins I've had. Granted, I haven't had a lot of fried chicken skin appetizers because my body is a temple, but these things were perfect. They were not at all greasy - just chips of audibly crunchy, wonderfully seasoned chicken skins. They were drizzled with white BBQ sauce (my drug of choice), and a sprinkle of thyme. I had trouble getting a good photo of the shrimp & grits, mostly because my tablemates wanted to eat it as soon as it touched the table. For those of you who don't know, Brock is known for his shrimp and grits - and I can see why. 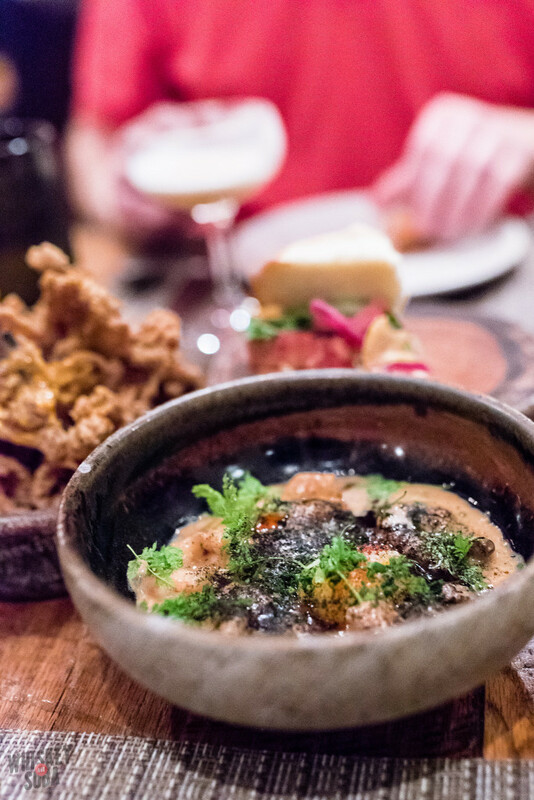 The grits were creamier than any I've had before, but what surprised me the most was the flavor of the dish: it tasted like my grandma's gumbo more than any shrimp and grits I've had before. Like a mix of a smokey sausage, shrimp (obviously), and hot sauce - that distinct trifecta that I've always associated with her gumbo. We devoured it. It definitely lived up to the hype. The last of the appetizers was the Snapper Collar with cucumber, herbs, radishes, and benne seeds. Crispy, smokey, way bigger than expected. 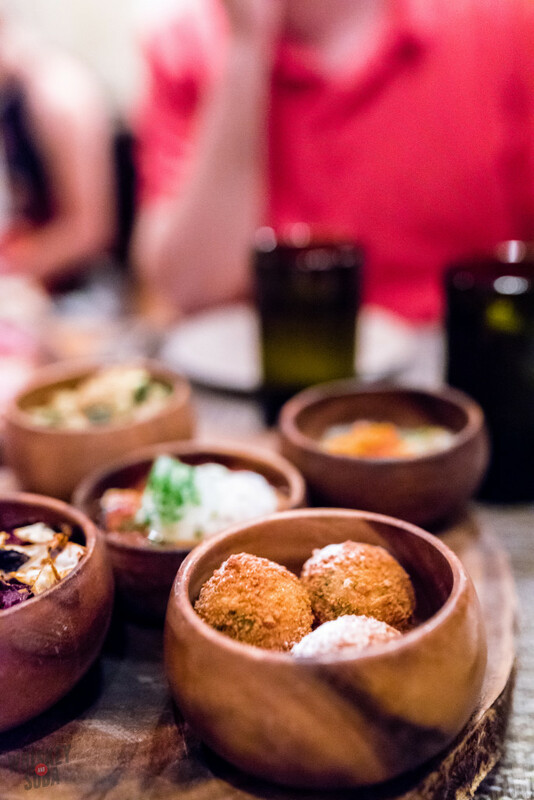 We wanted to to try as much as we could, so we decided to share entrees. First up was the Husk Charcuterie plate with pickles, dijonnaise, and these monstrous cheddar biscuits. I'd kill to eat those biscuits for breakfast everyday - especially with some of that Cheerwine belly ham in there. I foolishly forgot to write down what was on the platter, but it was all good. So good. All were good, minus the brassicas. Too much spice and bitterness for me. 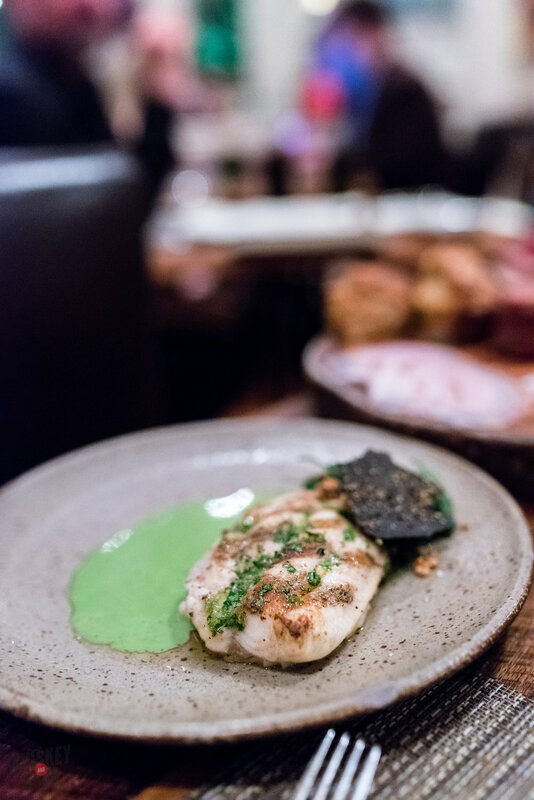 By this point, I had stretched my stomach about as far as it goes - but I still had to eat the [symple_highlight color="blue"]NC Catfish[/symple_highlight]. We'd all been drinking quite a bit by this point, but I do remember that the fish was a big hit. Green garlic dressing, smoked potatoes, nettles, and toasted buckwheat groats gave it a nice Spring taste. To finish the meal, we got the O&S Chocolate Pie, a dessert as delicious as everything else we'd had that night. 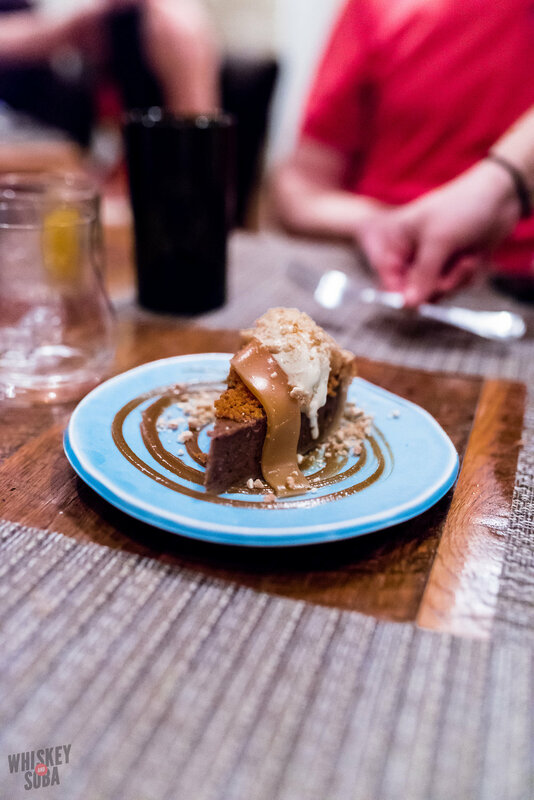 Served with peanut butter ice cream and a brown butter caramel, it was the perfect amount of decadence to close out the meal. We were so full that we Ubered back to our hotel - two blocks away. 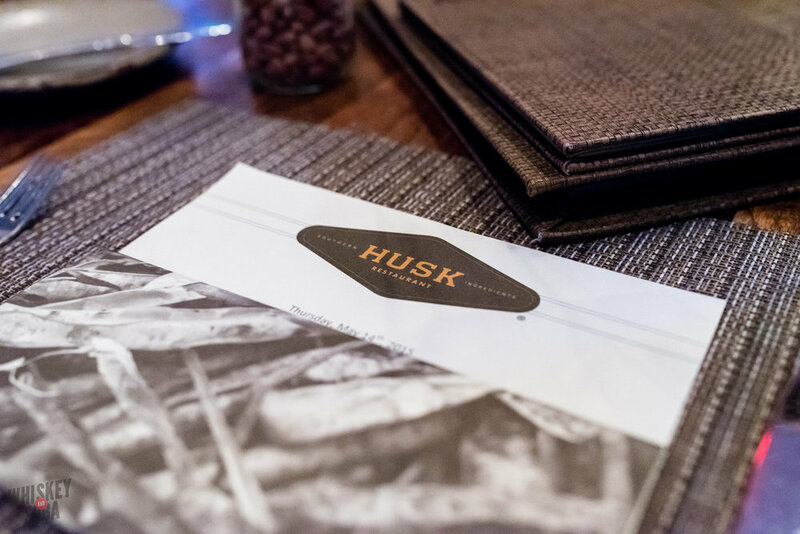 Our meal at Husk was one of the best I've had since starting this blog. This is a must visit for anyone going through Nashville.